While we all eagerly await the release of the recently announced Top Gun sequel, Tom Cruise's latest slice of polished Hollywood entertainment American Made, allows us all to see what it's like when Maverick becomes a little naughty in his retirement from flying fighter jets, verbally sparring with Iceman and making out with Kelly McGillis. Re-teaming with his Edge of Tomorrow director Doug Liman, American Made is a relentlessly energized and seriously fun examination of the true life story of American Airlines pilot Barry Seal, who gave up his life as an everyday pilot to not only become a CIA recruited pilot delivering messages, guns and various other treats to South American contacts, but a drug runner for the Pablo Escobar Columbian drug trade, which makes for a wild ride that would be utterly unbelievable were it not in fact based on truth. Fair warning to all, Liman and his leading man are totally uninterested in giving a dry history lesson of Seal's exploits, as American Made sees the two Hollywood heavy hitters instead turn their trajectory towards delivering a heightened and often over the top examination of these events and with Liman bringing his Bourne Identity and Edge of Tomorrow expertise with him to the event and with Cruise seemingly having the most fun his had in years, the risk to go for something different other than an awards baiting or dialogue heavy expose has paid off hugely, with American Made easily becoming one of the year's most purely fun and enjoyable rides. At almost 60 years of age you'd be rightfully thinking it's about time that Cruise take a seat back and enjoy a more quiet time in his career but the unstoppable and enthusiastic leading man is having a blast here bringing Seal to life. In almost every scene of the film, Cruise and Liman continue on with their rapport that they built in Edge of Tomorrow and Liman should be commended for bringing out Cruise's natural talents for comedy and when mixed with his easy going charisma that has made him such a beloved acting figure, Seal offers Cruise one of his best and most interesting roles in his long and varied career, no small feat when you consider the quality of his often underestimated C.V.
American Made's frenetic and sometimes scattered focus may detract from some viewers experiences and those looking for a more sombre take on a no doubt very serious topic may be disappointed but Liman and his cast's (that includes great bit turns from the likes of Sarah Wright as Seal's wife Lucy and Caleb Landry Jones as Lucy's dim-witted brother Bubba) ability to extract the absurdness and craziness of this whole situation and turn it into such a fun piece of entertainment should be a winner in the majority of cases, much like Scorsese's Wolf of Wall Street did. 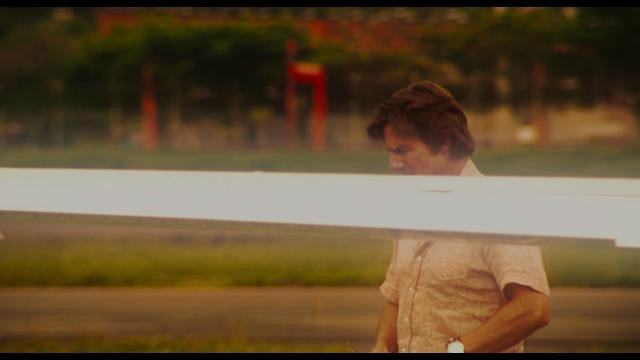 With Cruise on top form and Liman instilling his film with a breathtaking amount of energy, American Made is a pure piece of cinematic entertainment and an awesomely fun companion piece to Cruise's other well-known plane centred star vehicle.